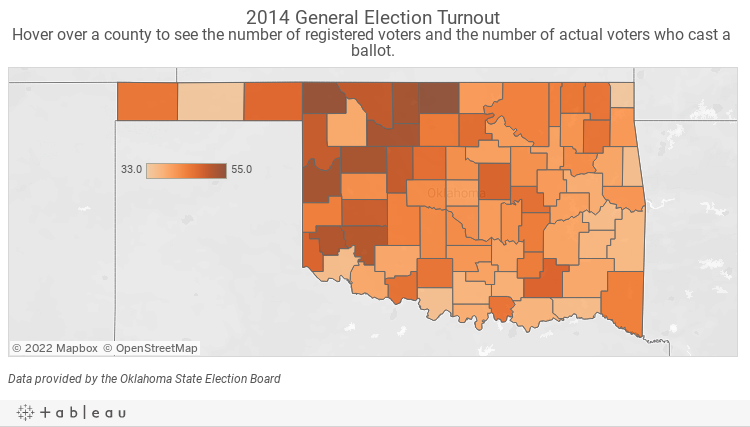 Voter turnout in Oklahoma’s election Tuesday was possibly the lowest on record in a state gubernatorial election, according to an analysis of state voting data by Oklahoma Watch. 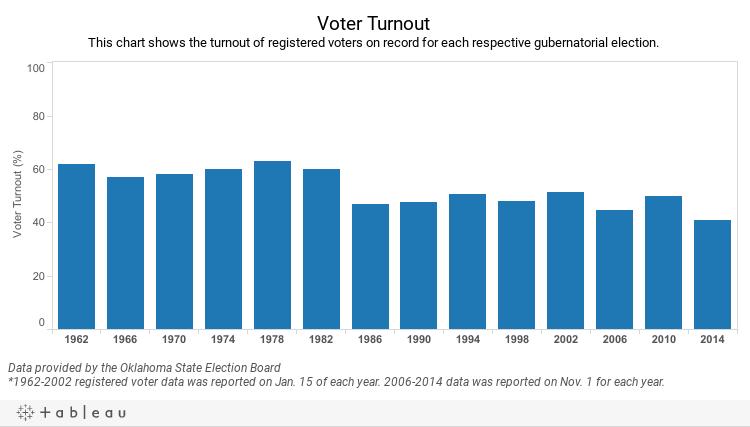 Statewide, 40.7 percent of registered voters showed up, the lowest recorded rate since 1962. Oklahoma started tracking voter registration at the state level in 1960. Data compiled by the U.S. Election Project last night also shows 29 percent of Oklahoma’s eligible voting population went to the polls, the sixth-lowest rate in the nation. This rate includes registered voters as well as people who are eligible to register but didn’t. The national rate, based on preliminary results, was about 37 percent. Oklahoma and many states across the nation struggled to attract voters to the polls, primarily because of a lack of competitive races or controversial ballot questions, some experts said. Tuesday’s results, which still need to be certified, appear to be the lowest on record in the state, but state Election Board officials said they can’t positively say that’s the case. The state has reported the number of registered voters on Nov. 1 since about 2004. Before then, registration was annually reported on Jan. 15 the year of the election. Bryan Dean, a spokesman for the department, said the reporting date was changed to get a more accurate look at election turnout because there is a bump in registration between January and October. Presidential elections tend to see higher turnout than gubernatorial races in Oklahoma. The 2012 presidential election saw 63.1 percent of voters cast a ballot. Keith Gaddie, a political science professor at the University of Oklahoma, said last night’s poor turnout is not surprising. The most contested race this year was for state schools superintendent, but that was essentially settled when Joy Hofmeister beat incumbent Janet Barresi during the June Republican primary, Gaddie said. There were no other contentious or tight races on the ballot to draw would-be voters, including the gubernatorial race between Republican incumbent Mary Fallin and her Democratic challenger Joe Dorman. 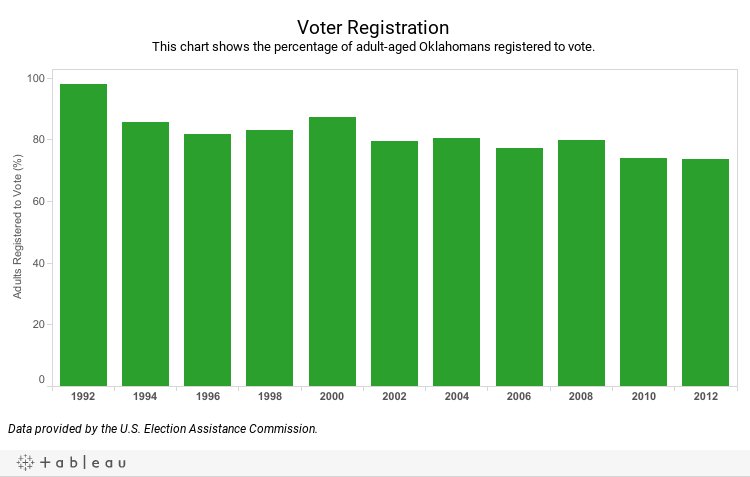 Oklahoma has also seen a steady decline in the percentage of the eligible population that actually registers to vote. About 98 percent of eligible voters were registered in 1992, according to the U.S. Election Assistance Commission. In 2012, only 74 percent of eligible voters were registered. Data for 2014 is not available yet. Many northwest Oklahoma counties saw higher turnout Tuesday compared with the rest of the state. Clerks with the election boards in Grant and Harper counties did not know why since there were no contentious races on their ballots. Cheryl Patterson, Garfield County elections clerk, said the region has historically been more active at the polls. Gaddie said the region historically has better turnout because residents are older and white – Oklahoma’s largest voting demographic. Oklahoma’s younger voters tend to be in central and eastern Oklahoma and are more diverse, Gaddie said. They also vote at lower rates, which could pose problems for Oklahoma’s future.